Wind engineering, during the last three decades has been recognised as an important emerging area of research and application, in the construction industry. A major focus has been given in the 12th Five Year Plan on the development of infrastructure such as high-rise buildings, power plant structures, bridges etc. Such structures are wind-sensitive and a rational assessment of wind loads and their wind –induced response is essential for safe and economic design of these structures. Wind engineering as applied to civil engineering structures is a multi-disciplinary area dealing with structural dynamics, aerodynamics, atmospheric science, mathematics, instrumentation etc. 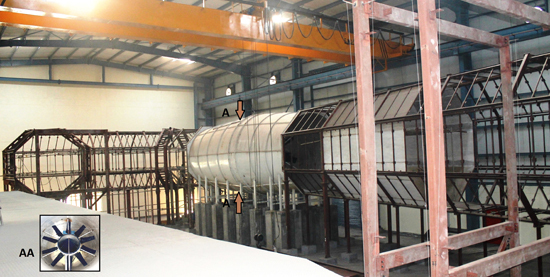 Boundary layer wind tunnel (BLWT) testing involves scientific studies by conducting experimental investigations on the models of different structures and it plays a central role in wind engineering for providing useful load/response inputs to structural engineers in design of various structures. Needless to say, skyscrapers such as Burj Khalifa , Dubai, Tokyo Sky Tree, Japan ,Petronas Twin Towers, Kaula Lumpur etc. have been tested in boundary layer wind tunnels . Currently the Indian Codes of Practice on wind loads are inadequate in providing recommendations for design of tall buildings with complex architectural shapes. Presently, only few BLWT facilities are functional for catering to civil engineering applications. Thus, with the far-fetching vision of our Founder Chairman Hon’ble Shri. Jai Prakash Gaur and with the generous support and constant encouragement of Hon’ble Shri. Manoj Gaur, Executive Chairman, towards achieving excellence in Wind Engineering , the JAYPEE Wind Engineering Application Centre (JP-WINCENTRE) with a state-of-the-art Boundary Layer Wind Tunnel (BLWT) facility is being established at the Jaypee University of Engineering & Technology (JUET) , Guna and it is in its advanced stage of construction. It may be stated that this facility is first of its kind in the private sector in India. The vision of this JP-WINCENTRE is to become a Centre of Excellence of International repute in the field of Wind Engineering and to provide innovative solutions to problems of industry and society, and to pursue quality research in wind engineering.